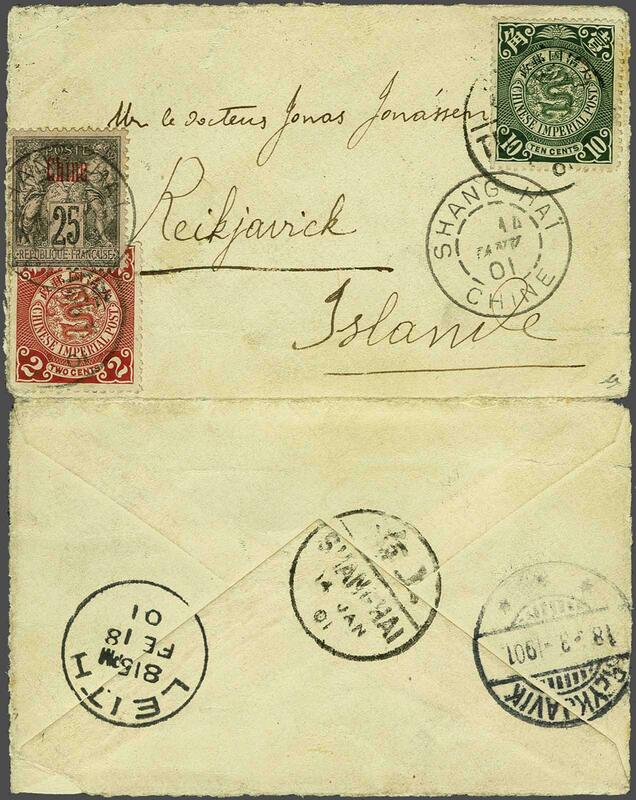 1901: Cover from Tientsin to Reykjavik, Iceland, franked by 1898 Coiling Dragon 2 c. scarlet and 10 c. deep green tied on despatch in Tientsin, the 2 c. overlapped by France 'Chine' 25 c. black on lilac tied by 'Shanghai / Chine' cds (Jan 14) in black. The cover sensibly opened for display with reverse showing Chinese Shanghai cds (Jan 14), Leith cds (Feb 18) and Reykjavik arrival cds (March 18). An extraordinary cover and most probably unique to this destination.